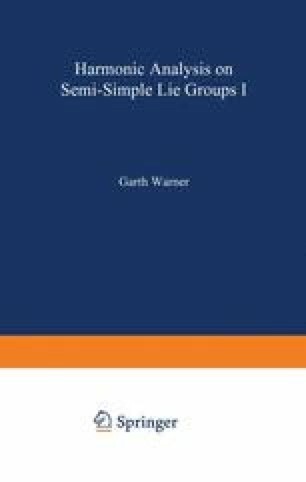 Let G be a Lie group, E a complete locally convex linear space over C. A continuous representation U of G on E is a homomorphism x ↦ U(x) of G into the group of topological automorphisms of E such that the map (x, a) ↦ U(x)a of G × E into E is continuous. Although our ultimate concern will be with continuous representations on a Banach space (or even a Hubert space), necessity dictates the need to formulate the fundamental notions of representation theory for more general spaces E. For instance, one has canonical continuous representations of G on the spaces C∞(G) and C c ∞ (G) (equipped with their usual topologies) or on the space of distributions on G. There are other reasons too. Thus, as will be seen in 4.4, the study of Banach representations leads one quickly to the consideration of continuous representations on a Fréchet space. On the other hand, ‘analytic continuation’of Banach representations can sometimes lead to continuous representations which simply cannot be realized on a Banach space.